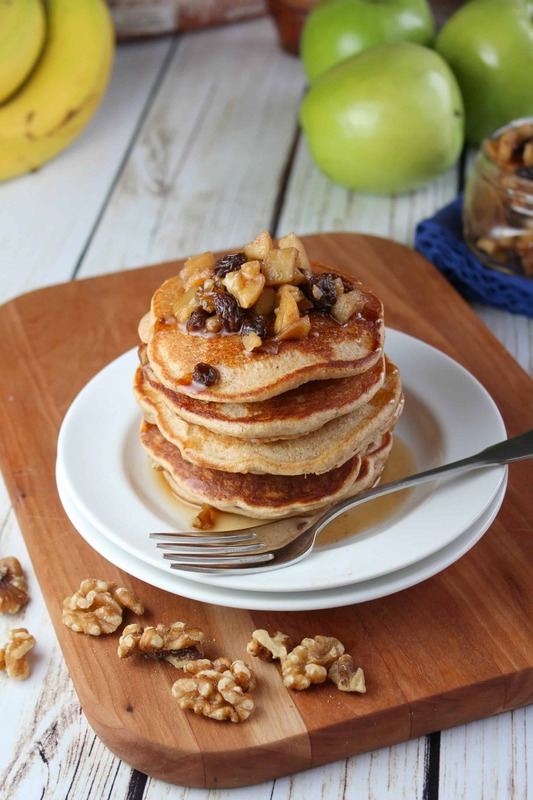 Let’s get our day started with these whole wheat banana walnut pancakes! 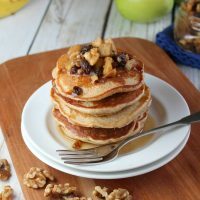 Banana pancakes are perfect with maple syrup and even better topped with this apple-walnut compote. 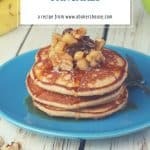 Homemade pancakes are a treat any day of the week; it really only takes a few minutes to whip up the batter and hardly any more time to make the pancakes. Baking with bananas is always a family favorite. Try recipes like banana cake, gluten free banana muffins, and upside down banana bread. Boost the nutritional value by using whole wheat flour, bananas and walnuts. These beauties are loaded with walnuts in celebration of National Walnut Day. Yes, there is a celebration (or multiple celebrations on some dates) for every day of the year and today walnuts are the star. And, hey, why not? Speaking of reasons to celebrate, try this spinach pancake recipe in the shape of shamrocks. So perfect for St. Patrick’s Day! 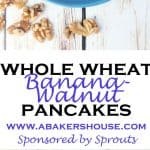 Let’s get our day started with these whole wheat banana walnut pancakes! They are perfect with maple syrup and even better topped with this apple-walnut compote. 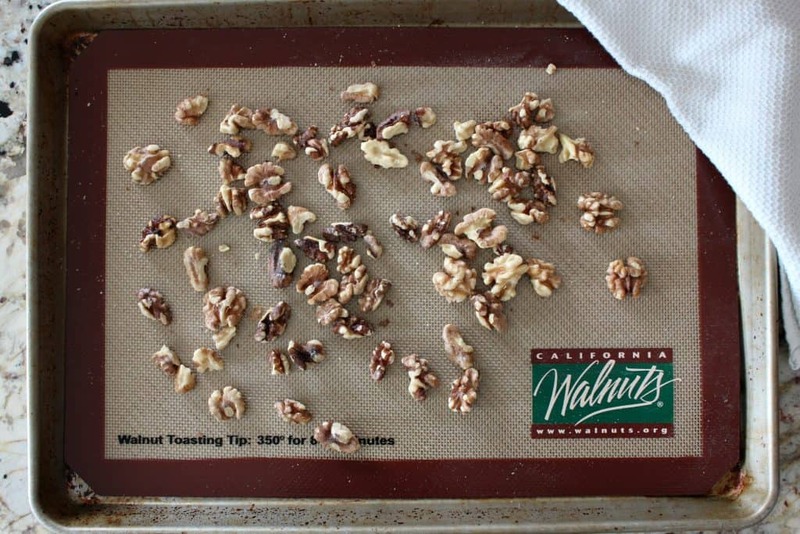 Make the compote: Heat the oven to 350 degrees F. Toast 1 cup walnuts for 8-10 minutes, tossing the walnuts once to redistribute. You’ll know the walnuts are toasted when they are lightly browned and fragrant. Set aside. In a small saucepan add the chopped apples, water, brown sugar, and cinnamon. Heat on medium for five minutes, stirring occasionally. Remove from heat and add the raisins and the toasted walnuts. Stir to combine. Set aside. 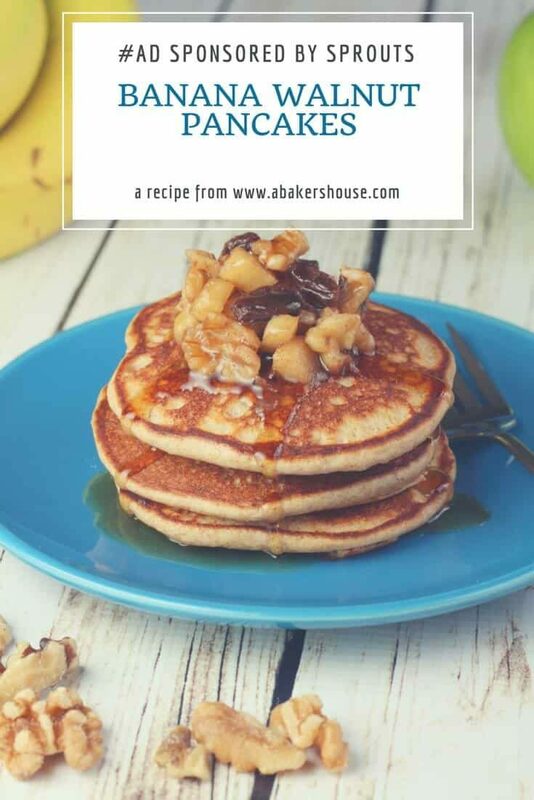 Make the pancakes: In a blender combine the bananas, milk, eggs, flour, and baking powder. Process until smooth. Pour the mixture into a medium bowl; add the chopped walnuts. Heat a large skillet or griddle on medium heat. Coat the skillet with a small bit of butter or baking spray. Scoop ¼ cup batter at a time onto the griddle. Cook for 2 minutes or until you see bubbles around the edges of the pancake. Flip and continue to cook for an additional minute. Remove and serve while hot. Top with maple syrup and apple compote. Makes 12 pancakes. The compote makes a lovely topping for these whole wheat pancakes. Are you on Pinterest? I am! Join me there by saving this pin on your boards. 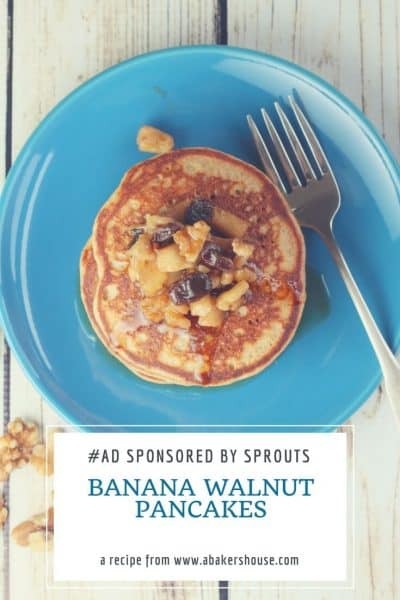 Check out the full recipe for whole wheat banana walnut pancakes along with the apple-walnut compote on the Sprouts Brand site here. Did you know these fun facts about walnuts? Walnuts are the only nut that offer an excellent source of the plant-based omega-3 ALA (2.5 grams/ounce), which is important for heart health and may help reduce the risk of heart disease. More than 25 years of research has shown how walnuts may play a role in heart health, brain health, cancer, weight and male reproductive health. Please note that this is a sponsored post. I developed this post in partnership with #Sprouts Farmers Market; ingredients were purchased at my local Sprouts store. I was compensated for my participation and all opinions are my own. Our friends at walnuts.org also contributed to the fun and sent me a lovely package of walnuts and other goodies. 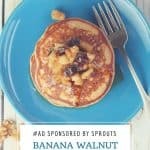 Many thanks to California Walnuts and to Sprouts for their collaboration on this sponsored post. Looking for more favorite #Sprouts recipes? Try French Toast Muffins, Breakfast Cookies, and Coconut Grapefruit Squares. I love walnuts which is a good thing since they are so good for you! Love pancakes, too. So funny though because today I made a banana cake with walnuts and a bit of chocolate! We must have nuts on the mind. Can’t wait to see you next week!